Tahiti an island to be discovered! Crowned by a circle of majestic peaks, the Island of Tahiti, the largest island in French Polynesia, towers over the ocean like a proud and royal Queen. The mountainous interior is adorned with mystical valleys, clear streams, and high waterfalls. Most of the island’s population resides near the shore, leaving the interior of the island feeling almost untouched and ancient, despite such proximity to the bustling capital of Papeete. Papeete, meaning “water basket,” was once a gathering place where Tahitians came to fill their calabashes with fresh water. Now, Papeete, the touchstone of this island nation, boasts spas, fine dining and unique restaurants, amazing Paofai gardens, gorgeous marina, vibrant market, museums, pearl shops, and boutiques. Staying in Papeete while your stay in Tahiti is the easiest way to discover this great island. Papeete being very central you will have access to both islands coats very easily. The City’apart, a brand new short term rental is definitely one of the places to stay in Papeete. Located in a newly built residence it offers 2 air-conditioned bedrooms, 1 bathroom, 1 spacious living room with fully equipped kitchen and a balcony facing the west coast and the sea away. It welcomes comfortably 4 persons. It can be rented from 3 nights only. Starting at 191 Euros/ night. We would like to thank you for staying with us and for choosing Tahiti Homes for your holidays! Photos must be taken during a past stay at any Tahiti Homes rental. 10% will be deducted of your accommodation rental amount for your next stay at any Tahiti Homes rental of your choice. Offer valid for all past stays until December 31st, 2018. Valid for any next stay in 2018 or 2019 (except between Dec 22 to Jan 3). Please contact us at info@tahiti-homes.com once the tags are posted. Villa Rea is brand new in the vacation rental market and complete nicely our collection of pool holiday homes in Tahiti main island. This 2-bedroom villa with pool and unsurpassed views on Moorea island and the lagoon is ideally located on the west coast of Tahiti in Punaauia city. Hillside and well ventilated this modern and vacation rental is only available for couple of months. Its rental rates are incredible low for 4 sleeps, free WIFI, Free satellite Channels and Netflix, air conditioning in one bedroom and in the living room. Villa Manatea is an amazing vacation rental with pool offering spectacular views on the lagoon! It is composed of one main house and 2 independent bungalows with en-suite bathrooms.The Villa Manatea is designed to offer maximum intimacy to its guests. With high quality furniture, smart lights and free WIFI, technology is present everywhere. It sleeps comfortably 10 persons. Villa Te Moana is an exceptional Polynesian villa located on Tahiti main island. It has been built in the respect of Polynesian architecture and lifestyle. Composed of multiple thatched roof bungalows on a almost 5000 sq meters land, it offers lots of intimacy and privacy to its guests. Its incredible tropical garden is an invitation to a Polynesian journey and dream. The villa has 6 bedrooms all with air conditioning and 5 bathrooms. It sleeps 11 persons. To complete the numerous amenities available, two house personnel are at the disposal of the guests during their stay. A housekeeper and a cook. Sea views are spectacular and the beach is 135m long. From $2,500 per night, minimum 2 consecutive nights. 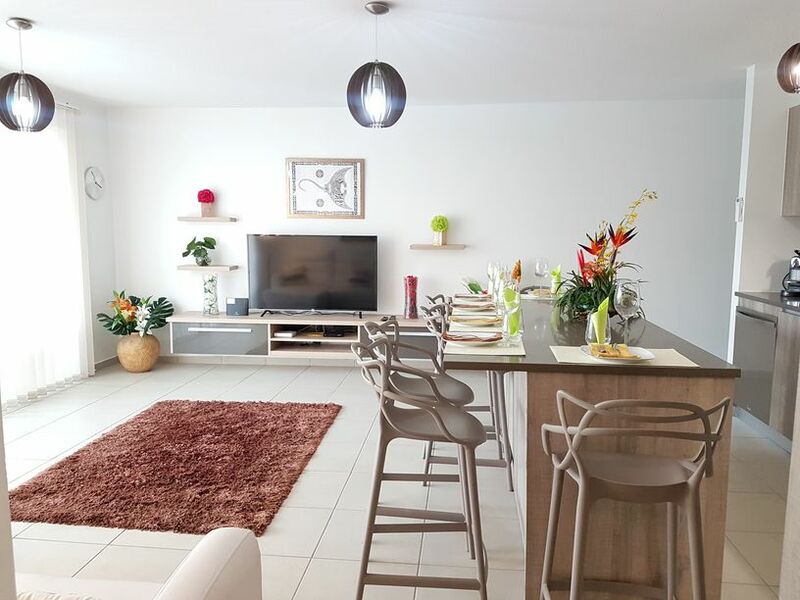 Apartment Moeta is a brand new and modern apartment situated in the heights of Papeete, Tahiti island. 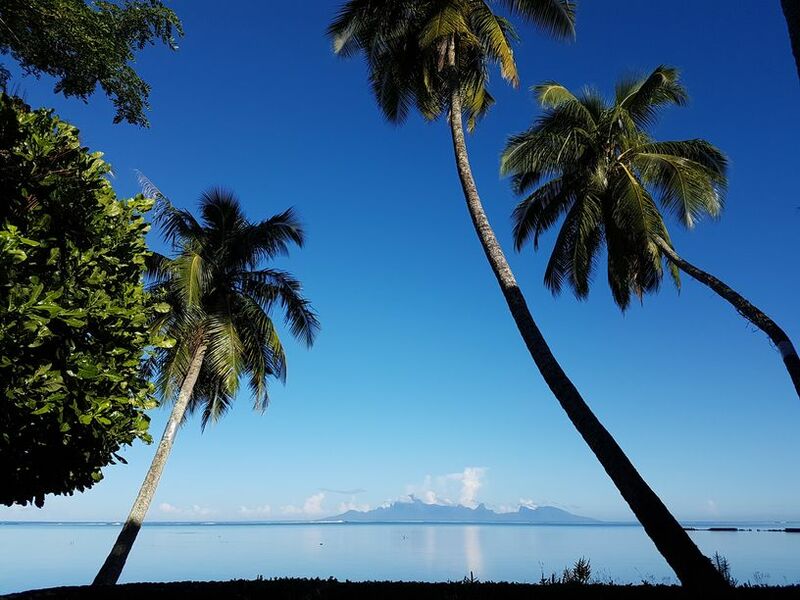 Ideally located at few minutes drive from the international airport and the ferry terminal it is the perfect rental to discover Tahiti main island. 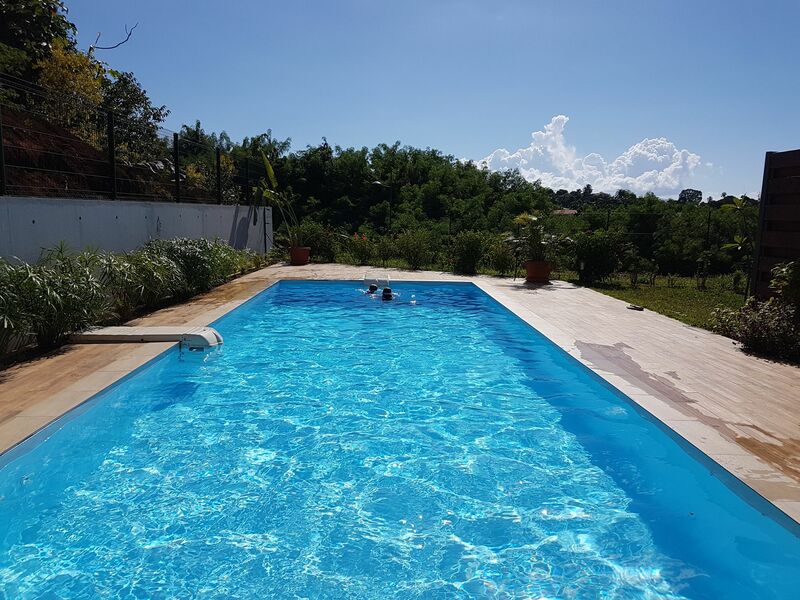 Recently furnished and equipped with comfortable and modern furniture, it has 3 air conditioned bedrooms, 2 bathrooms, a spacious living room opening on to a covered terrace facing the garden. It sleeps up to 8 persons thanks to the convertible sofa. The must of this apartment is the private access to the community pool straight from its private garden. From $200 per night minimum 4 consecutive nights. Exit cleaning and laundry in extra. 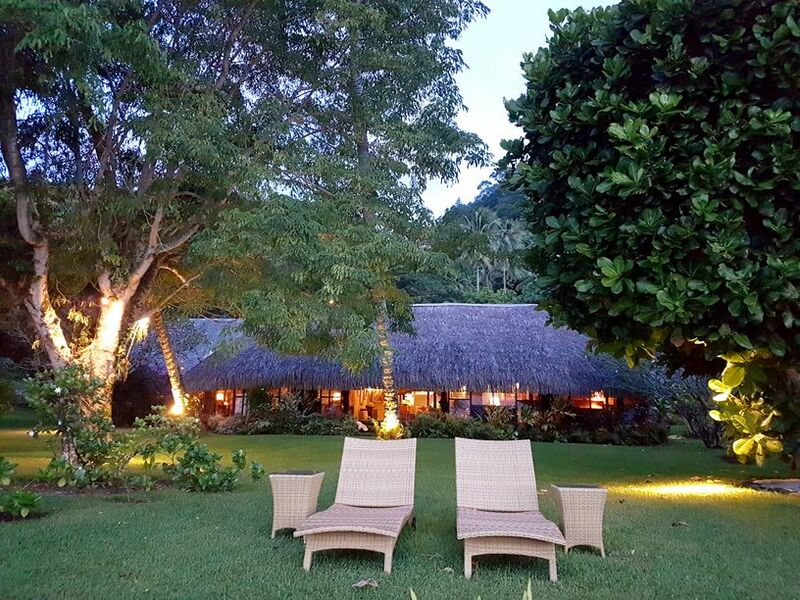 The “Beach House” Ofaipapa is a spacious and comfortable Polynesian bungalow in the heart of an immense exceptional property in Paea on the island of Tahiti, French Polynesia. As its name suggests, this air-conditioned two-bedroom bungalow is located by the sea. The beach and the lagoon will be your favorite playgrounds during your stay. Kayaks are at your disposal to explore the lagoon. From 1020 Euros per week, sleeps 4. Rental possible from 5 consecutive nights. To learn more about the “Beach House” Ofaipapa click here. Tahiti is an island to discover! Most travelers don’t spend much time in Tahiti main island, and we must say that they are wrong. As you travel throughout the islands, the island of Tahiti slowly unveils its beauty. It can be explored in many different ways: black sand beaches on the East coast, white sand beaches on the West coast, diving, beginner’s and legendary surf spots, mountainous peaks within desert lush valleys or the historic site of Papeete’s colorful market, wonderful seaside Paofa’i Gardens and you may enjoy numerous seaside restaurants and bars. If you are planning a trip in our islands why not rent a fully equipped apartment in the heart of Tahiti and go explore the local Tahitian lifestyle. Here are two new new apartments in our collection that couples and honeymooners will love to stay in. Christmas is just around the corner, it’s the perfect time to take advantage to have the whole family together to plan your 2018 vacation. There’s travel that everyone wish about : Tahiti! and the youngest will love it too as we have a special gift that will please everyone! As a Christmas gift, Tahiti Homes offers a Free Nomad WiFi! Stay connected wherever you go and visit in our islands. Share instantly your precious Polynesian moments with your friends and beloved. With the Free Nomad WIFI, you can connect your phone, tablet, laptop simultaneously and start browsing the web. With the Free Nomad WIFI, Tahiti Homes will color your social networks! Book now with Tahiti Homes and enjoy unforgettable connected holidays! Valid for all stays booked until December 31st, 2017. Stays must be completed by May, 31st, 2018.